The country's major oil refineries, the importance of which is evident on a global scale, operate side by side with penal colonies. The beauty of the taiga lands surrounding Baikal, the wide Angara river which gave its name to the city, cliffs concealing a multitude of caves, and the wilderness of Eastern Siberia... It is not easy to understand how all this coexists with the polluted environment caused by the release of hazardous chemical substances from the plants and mills. The chemical and petrochemical plant is located in the industrial part of the town. It is in fact thanks to the construction of this large petrochemical plant that Angarsk originated. After the war, special equipment to produce synthetic liquid fuel was brought here from Germany as compensation for material losses during the war. Since 1947, in the course of a few years, the sophisticated equipment was delivered by the Trans-Siberian Railway to the Angara river and its tributary the Kitoy. Here, there stood a massive pine forest, rich in game, berries and mushrooms - a favourite place of the Irkutsk administration for relaxation, which was given over to the plant's territory on the instruction of Stalin. Builders and industry specialists came to this settlement on long-term assignments; they were given accommodation, and put on the payroll on an individual basis. Many architects came from Leningrad (St. Petersburg). Longing for their native city, they portrayed it in architecture in the wilderness of Siberia, which added some special charm from the northern capital to the grey industrial Angarsk. Many buildings in Angarsk were not only designed in the same way as those in St. Petersburg, but were literally copied from them. For example, the entrance to the city along Lenin Street from the direction of the railway station, named Angarsk Gate. Most buildings on Kirov Street also exhibit this nostalgia for home. On 30 May 1951, Angarsk was granted the status of a town. 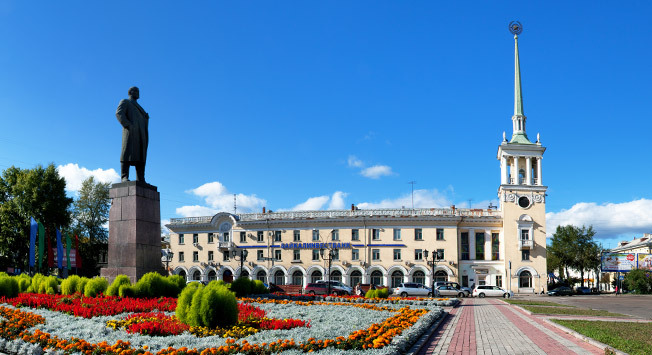 Angarsk can nominally be divided into two parts: the old town - an architecturally picturesque centre, which was built by architects from Leningrad, and the new "sleeping district" which has gradually grown around the Sovremennik Sultural Centre. Baikalsk and Severny are considered prestigious areas with private cottages, while many others are viewed as disadvantaged ghettos with deserted buildings. For instance, in Maysk, there is an abandoned railway station, which retains a special charm with its empty rusty rails. Not far from it, there is an abandoned air defence position, which defended Irkutsk and Angarsk from air attack. An articulate lorry still stands here today. The streets which divide the city into quarters are separated by numerous pine tree parks - these are the parts of nature, which as it was decided, were not to be touched by construction. These parks separate the city from the industrial zones, which surround it from all sides. The greenest area embodying the idea of true Eastern Siberia is the settlement of Kitoy ,which stretches along the mountain river bearing the same name which has its source in the Sayan Mountains and is a left tributary of Angara. Sandy beaches, cedars and pines surround its shores. The Kitoy, with its intermittent rapids and large boulders, is not navigable. It is a challenging place for canoeists, and the degree of difficulty has even been officially categorised for rafters who come to train here from all over Russia. Fishermen adore the Kitoy as well. In it’s waters, there are a lot of fish: goldilock, trout, dace, pike, gudgeon, perch and burbot. Fish mainly migrate up here from the Angara, but there are also local fish. Cliffs stretch along the banks, with pure springs flowing from under the cliffs, and there are also real caves. The most famous cave is Koziy Dvor (Goat Yard). This is a chasm of an impressive size, with ice lying at the bottom of it all year round. At the bottom, bones of goats and deer that had fallen off the cliff were found, from which the cave got it’s name. Angarsk, just like St. Petersburg, has many trams. And just as in St. Petersburg, trams cause a lot of difficulties for motorists, being at the same time a vital part of the town's history. Connecting people's homes with their places of work and recreation, trams have become a symbol and the pride of Angarsk. The total length of all the tram rails is presently 77.7 kilometres. Thanks to the popularity of the environmentally friendly trams, the town is not over polluted with the exhaust gases of public transport. The most beautiful tram route passes along Angarsk's main thoroughfare - Karl Marx Street. Along this route, you will see the Polytechnic College - the longest building in Angarsk, as well as a house where every window has a chimney coming from it - because of the need for stoves before the central heating is connected. You will pass by the House of Artists, where Siberian artists exhibit their works, and the Clock Museum, famous throughout the whole country, located nearby. It is the Clock Museum that has become the main museum in Angarsk and the only such one in Russia, with over 1,300 exhibits from Russia, Europe and Japan. Every hour, under the strict control of the museum's curators, all clocks that work come to life and begin to chime, sing and dance. The museum was founded in 1968 thanks to Pavel Kurdyukov, a toolmaker who had always been interested in clock mechanisms. Over the years, the museum has collected some stately grandfather clocks and branded mantel clocks made by Czech masters. It is not even clear what was more important for the owners of these lounge clocks: the time itself or their rich and unique decoration. Together with the simplest solar clock, a water clock, a sand clock and even a fire clock, a very interesting steam locomotive clock and a steam engine clock are exhibited here. There are clocks made specifically for aircrafts, tanks, vehicles and a space station - the latter is a special gift from the cosmonaut G. Grechko. A watch made from a time-delay action mine is amazing. It looks like a normal alarm clock but has a toggle switch connected to a hammer. When the alarm goes off, the hammer touches the bell, thereby closing the electrical circuit, which can be used to trigger the explosion. The famous clock by the Bronnikov watchmasters, which amazed Crown Prince Alexander in 1837, is also present in the collection. This clock, entirely carved out of wood, with wooden gears and hands and even a wooden chain, has become the trademark of the whole dynasty of watchmakers. The Mineral Museum, the second-largest museum in the city, has gathered together a valuable collection of stones and minerals from all regions of the former Soviet Union and Mongolia. The museum came into existence thanks to the priceless collection of rocks and minerals collected by geologists from Angarsk. Some coloured ornamental stones are from the only deposit in the world. The mineral charoite, for instance, is only found in one place in the world - on the border of the Irkutsk Region and Yakutia! Yuri Rogov, the Soviet geologist who discovered this mineral, even refused to sell it to the mineralogical museum of the Louvre, which was proud of its most complete collection of minerals. The clock on the post office building in the city centre has become Angarsk's main attraction. The city with the country's only Clock Museum had to have its own large clock tower. Kurdyukov, of course, designed this clock mechanism. He wanted the clock to chime and play its own melody. It proved rather difficult to construct such a bulky clock tower: the clock's face was made from sheet steel while its Roman figures were cast in duraluminium and covered with bronze paint. The clock operates on a drive employing a sophisticated mechanism, and nobody could wind it up after the master's death. The erection of the Monument to Political Convicts was an important event for the town. This monument stands at the beginning of the street, which serves as the west gateway to Angarsk, from where prisoners were brought and then distributed to Siberian prisons. It is the only such monument along the whole length of the Siberian Route (aka Moscow Route) from the Urals to the Pacific Ocean. This road was not only a trade route linking the European part of Russia to China, but was also a gruelling stage in the life of political convicts, prisoners and the Decembrists. They were transported along this Route to Siberia in chains in groups of 200, and sometimes 500, people. A mournful heavy song and the clanging of chains accompanied this terrible procession. When a prisoner escaped, guards would sometimes grab any passer-by who happened to be on the road, and deliver him to the next leg on the way to the destination instead of the escaped prisoner. We would like to mention a cult place in Angarsk - the confectionery restaurant called Staraya Kvartira ("The Old Apartment"). Homemade cakes, interesting tasty dishes and, most importantly, vintage retro decor with antique gramophones, records, utensils, books and magazines from Soviet times can all be enjoyed here. Even the smell inside seems sort of vintage. Angarsk has gained a status of a somewhat unusual town thanks to its unusual monuments as well. This is the only place where you can see a monument to the marmot, which was erected in 2005. The tarbagan marmot is a wild furry animal that saved the Irkutsk region during the difficult times of the economic downturn in the 1980s-1990s. Hats famous all over the country were made from the animal's fur with every second family being involved in the manufacture of them.